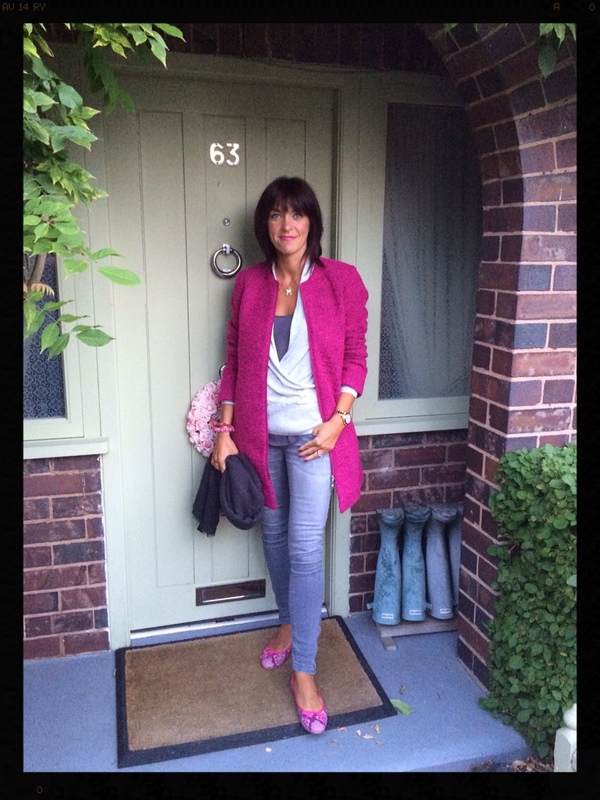 Yup that's right for me this autumn is all about accessorising my greys, blues & blacks with a splash of hot pink. No more of the pale pink that was so hot last winter but a jewel like sunburst shot of fuchsia.....you have been warned!!! Now before we get onto my latest addition of said hot pink I just wanted to share with you these pictures & gorgeous items of clothing. Starting with my main weakness - a stunning black boucle jacket......sigh. I love, love, love this & for those of you who feel too officey (not sure that's a word but for the purposes of today it is!) when wearing a tailored blazer then the slightly relaxed fit of this jacket not to mention the zip fastening as opposed to buttons should be ideal. In fact I'm also loving the shirt! Black & blue is a colour combo I wouldn't have felt comfortable wearing a couple of years ago but now I have to say I absolutely love it & mixed with a bit of what I call marl grey this really is a stunning combination. Keeping with combining black & blue, this next coat also really caught my eye. I love it teamed with the black skinny jeans & ankle boots & think it would look amazing when teamed with a black top as well. I'm also loving the look of this faux fur gilet. I really love it teamed with the belt too & it's a look I'd love to rock but whenever I try it I end up looking like an over pumped inflatable, but perhaps it's down to finding the right kind of gilet - furry but not too fluffy?!! Now you might have noticed that so far I've deliberately not stated where the above beauties are from & unless you've clicked on the links you're probably still wondering....well the reason I chose to keep you in the dark is if I'd told you at the start you might have, like me, had a preconceived opinion of the brand & dismissed the items without a second thought. After all I think this is something we can all be guilty of in some shape or form throughout our lives. So any ideas who the brand is?!! Would you believe it's Damart?!!! Yup who'd have thought it!!! If I'm being honest unless I'd seen these images I'd have simply scoffed at the thought of wearing let alone wanting to own an item of clothing from Damart as surely it's all about thermal underwear (not to be scoffed at during the depths of winter obviously!!) & older lady 'sensible' clothes....I'm thinking elasticated waists & sensible fleeces right?!!! Err no as these pictures testify, they seriously have some gorgeous & stylish pieces & I've only featured a small selection of the clothing catching my eye! I've been lucky enough for Damart to very kindly let me pick an item to style & wear & I can honestly say hand on heart that I was super excited waiting for this baby to arrive on my doorstep. As I've mentioned a few times recently I'm loving hot pink so the instant I saw the below picture I knew this would be the item I'd pick. Not only is it machine washable it's going to be a great coat for simply throwing on & either dressing up with a simple shift dress or dressing down with some distressed denim & the colour is just gorgeous. A really bright & strong fuchsia pink which is toned down by the black fleck running through the textured/boucle like fabric. 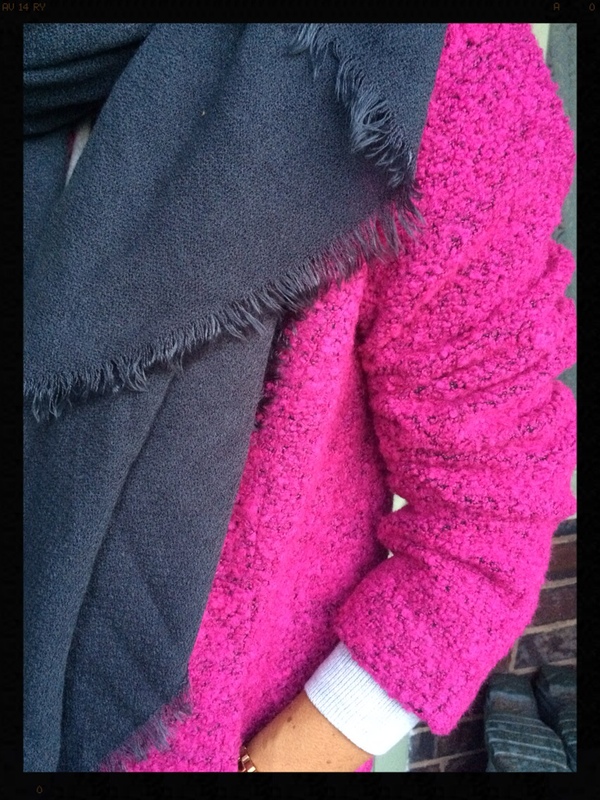 The perfect coat when you don't want something tailored but need something heavier than a coatigan or gilet & it's lovely & soft not to mention warm too! Naturally I had to have a little bit of a trying on session! I honestly have to say I seriously love this coat & I reckon it's going to be getting a fair share of wear over the coming months. 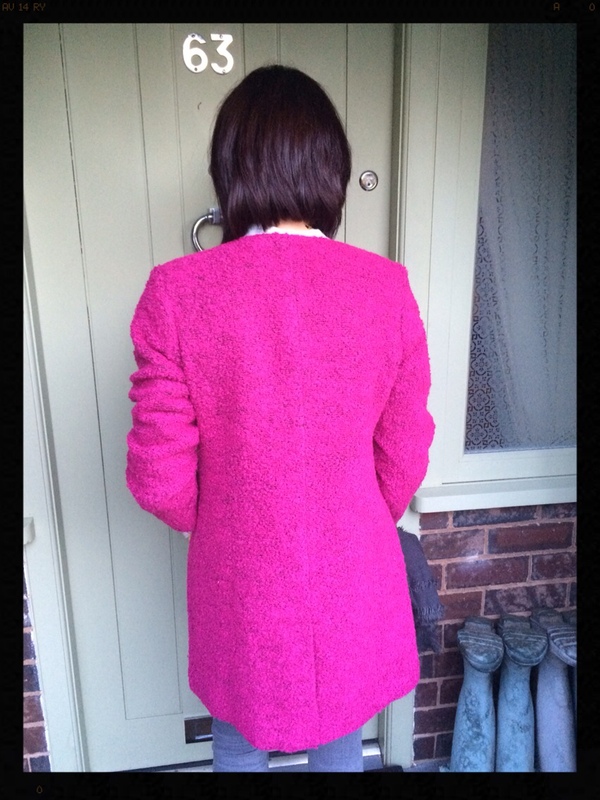 Damart's sizing starts from a size 10 & if I'm being truly honest as I'll probably only wear the coat undone it's a little too big for me, especially from the back. So I'm going to take it to a local dressmaker to have a little bit taken in down the central back seam as it's simply too stunning not to wear this winter & it's certainly going to fill my bright coat hole rather nicely! So you have been warned expect to see this baby featuring heavily over the coming months!! So come on time to be honest do you like what you see in the above images? 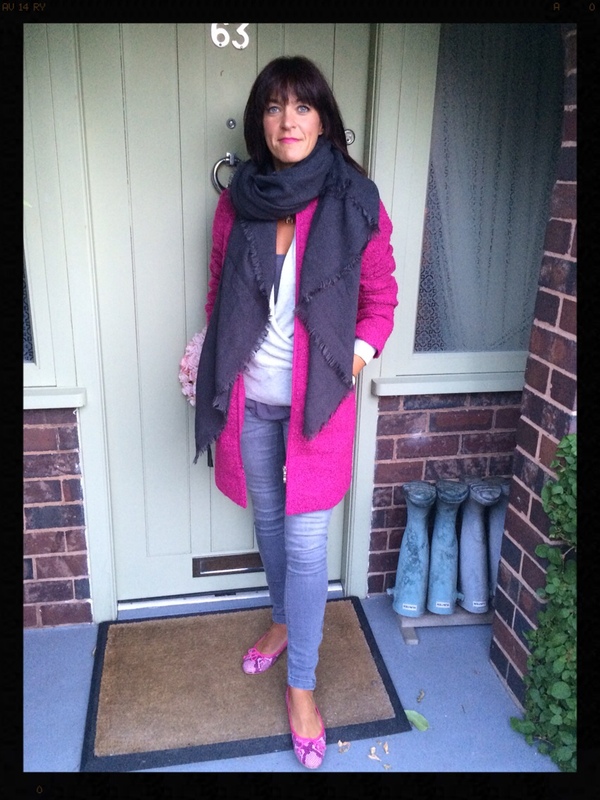 Are you thinking of going down the bright coat trendy this winter? Perhaps you're surprised that these items are from Damart? And most importantly would you now put Damart on your radar & take a peak at their offerings?! I have to say I'm amazed by the above looks as it's certainly not what I'd have expected & if the coat is anything to go by it's definitely worth taking time out to see what Damart has to offer as you're going to be pleasantly surprised. As always I love reading your comments & thoughts. Damart have some great pieces Emma, which amazes me as I've always thought they only did thermals!! So pleased you love your gilet, it looked gorgeous & I can't wait to see you in it. 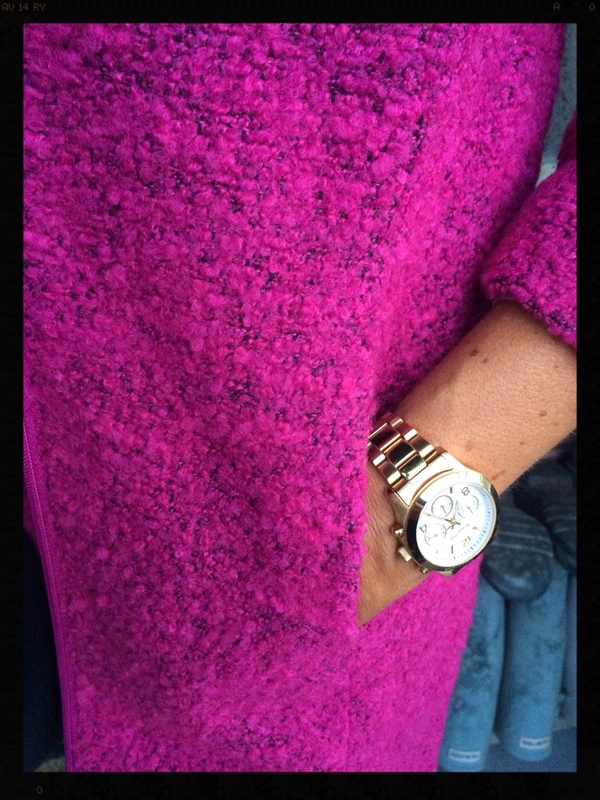 Thanks Sarah it's the perfect colour for brightening up dull winter days isn't it?! Gorgeous coat Jane, love it! Jane that coat is stunning on you. Even better than on the model on their website. Fabulous colour and style. 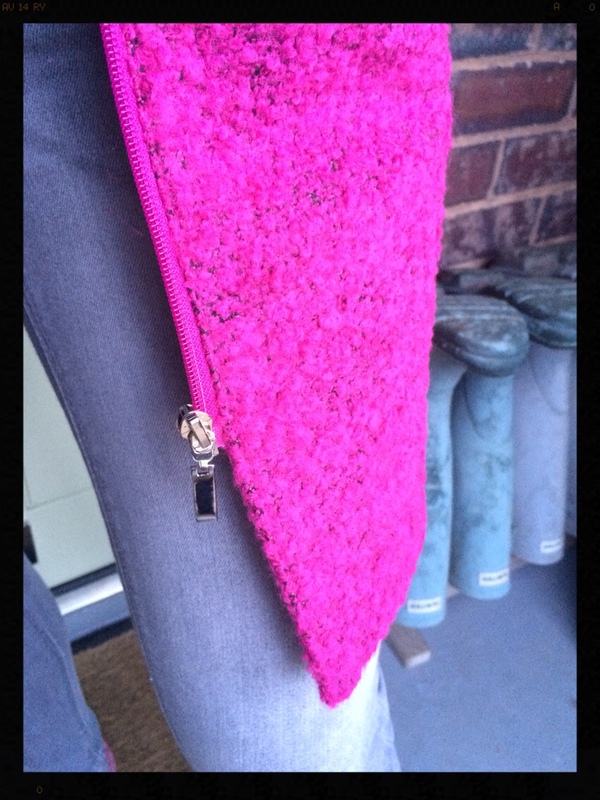 I would love it in another colour as I cant wear pink �� Damart are definitely making an effort this year. That shade of pink is perfect for you. Aww thanks Emer I've got a big smile on my face after reading your comment :-) Yes it's a shame it's not available in other colours, a navy would be gorgeous & so useful too! They've got some great pieces Sian, definitely worth having a peak & not silly prices either! Thanks Lynne. I was tempted to choose the gilet as it looks gorgeous although to be honest there were lots of pieces I was tempted by including some gorgeous scarves that are still on my radar!! Thanks Michelle. Damart have certainly got some stunning picks to tempt you haven't they?! Thanks Emily, I seem to be being drawn to all things of this shade at the moment so thank goodness it seems to be one of the colours this autumn! This is a lovely colour on you Jane. Damart have some lovely things this season. Thanks Abbi & yes Damart have some amazing pieces this autumn.